Career management is a must if you expect to gain maximum success and happiness from the hours you invest in work. You are likely going to work 40 hours a week for your entire adult life, and by managing your career effectively, you can make the best of those 40 hours. Share your goals with your boss and gain a partner who can help you broaden your experience. Developing your talents and skills will stretch your world and enable more of your unique contribution. This, in turn, can make your career success. Many employees have not thought past their current job or the next promotion they'd like to receive. They need to broaden their short-term thinking. 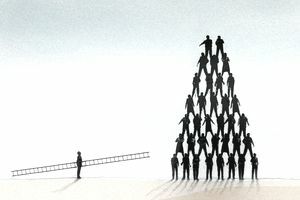 As employees are promoted up the organization chart, fewer jobs become available, yet continuing to grow skills and experience should still be a priority for people obtaining value from and adding value to their career. Job shadow other employees in your company to learn about different jobs. This can broaden your skills and increase your value. Explore lateral moves to broaden and deepen your experience. It's easy to get stuck in a rut. Being able to handle multiple jobs can add variety to what you do and broaden your skills. Attend classes and training sessions to increase your knowledge. New strategies and technologies relevant to just about every career are being introduced constantly. Stay up to date on your job and industry. Seek a mentor from a different department that you'd like to explore. Leaning on someone else's experience is a great way to gain knowledge and introduce yourself to other opportunities. Dr. Tracey Wilen-Daugenti, vice president and managing director of Apollo Research Institute and visiting scholar in Stanford University's Media X program, recommends five additional career management strategies. Set goals and create a plan to achieve them. Could your career development and management use help to gain momentum? People who are the most successful and satisfied in their careers have proactively determined what they want from work. Develop a timeline, including milestones. Bringing your boss and his or her sponsorship and mentoring into the picture will ensure that you have an internal mentor who will help you manage your career. Utilize company programs. Some companies have formal programs to help employees develop their careers. In others, you will need to informally pursue your career development. Companies with programs generally focus energy on helping employees develop and follow a career path. Own your career path. A career path can be discussed at several bi-annual meetings with your boss. Some companies demonstrate a deep commitment to their employees by assisting where possible with resources of time and dollars. However, remember that it is your career path. Write it down. Career paths are recommended for the same reason that goals are recommended. They are the written plan that can help each employee take charge of what is most important to his or her fulfillment and success. Without a plan, you can feel rudderless and you have no benchmark against which you can measure your progress.